John 8:32: You will know the truth and the truth will set you free. Many of us travel through a life that we didn’t create. We make decisions according to what society thinks we should do. We choose careers our parents desired for us. We want to buy the things advertisers tell us we want. There are many lies we tell ourselves. We live with ourselves all day long but we often don’t take the time to know the real us. Our culture impresses an image on us that we want to live up to. We tell ourselves the lies we need to hear in order to survive. 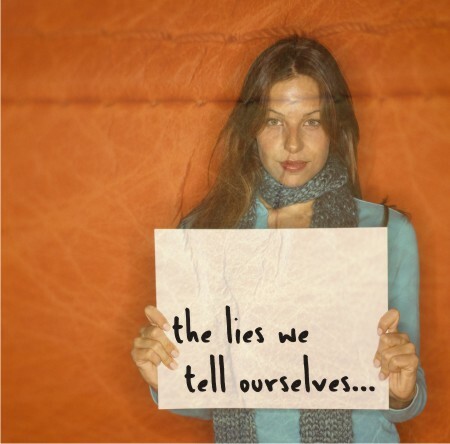 We may not initially recognize how much we do lie to ourselves. It is an easy thing to deny because there is no solid evidence that we do so. We don’t utter the lie aloud, and no-one is there to hold us accountable. Therefore, it is easy to pretend that it never happened (thereby lying to ourselves yet again). Ironically, deceiving ourselves requires more maintenance than most other lies. All these lies, this tissue of pretense we weave, are the desire to become that which we pretend to be: the desire for our lies to come true. When we lie, we are denying a central part of our own identity. I’ll go a step further and say when we’re disconnected from God; we cannot know our full self. So we lie. To ourselves. To others. My uncle asked me a pointed question a couple months ago: Do we lie because we’re terrified others will figure out we don’t know who we are? If we’re called to be honest with ourselves and with God, then shouldn’t we be honest about the realities in our world? Oh that requires some very tough and terrifying conversations. I believe the church should be asking those questions before anyone else. We look at our culture and world and there is such a big disconnect. We are disconnected from each other. And we pass by hundreds of people each day that are disconnected from the very God who created them. I’m tired of lying. I’m tired of lying to myself. I’m tired of tip-toeing around the truth. I’m tired of sitting in meetings where no one names the real issue. We sometimes encourage people to name the “elephant” in the room. The awkward truth that no one wants to talk about. Nancy Ortberg said we need to let the elephant into the room. It’s easier to clean up after the elephant when we know where it is. Being a Christian means getting uncomfortable and awkward. God didn’t say this life would be free of tension. Somewhere along the line, I believed the lie that life should always be pleasant.